When it comes to bucket lists, a visit to Brazil is right up there with looking amazing at your high school reunion, in other words you will be very disappointed if you don’t. The country with its subtropical climate, ridiculously attractive people and jovial atmosphere is the ideal holiday destination for someone looking for a break from the mundane. The great thing about visiting Brazil is that if you are a South African citizen and are staying for under 90 days (who really holiday’s for more than 90 days) you do not need a visa, which saves you tons on money and paper work; just make sure you have all your shots and a valid passport. I visited in January for a highlight on the Brazilian calendar, no not the annual Carnival with its costumes and samba dancing (that is for my next trip and takes place around Easter) but for São Paulo Fashion week, which is known as Latin America's pre-eminent fashion event and is considered the fifth largest fashion week in the world behind New York, London, Paris and Milan. São Paulo is the largest city in Brazil, which also happens to be the world's seventh largest city by population and was a treat to visit. I opted to fly SAA because I have always experienced the utmost level of professionalism from them. The business class flight from Johannesburg to Guarulhos International Airport took about 12 hours. There was plenty of room to stretch out as the pod like seats can recline completely for sleep (once you figure out which button does what) so you can nap or settle in with the comfy duvet and pillow and watch movies and play games on the overhead screen. The food was also pretty good (as airline food goes). I have heard good things about their economy class seating as well - comfy with loads of leg room. The first thing I noted after arriving in the country was how much it reminded me of South Africa, the architecture, the different cultures and ethnicities and even the vast differences between the luxury of the city and suburbs and the desolation of the slums (Favelas). In fact if it wasn’t for the fact that people kept addressing me in Portuguese I would have felt right at home. Although many people in the country do speak English it really helps to learn some Portuguese phrases such as “please”, “thank you”, and the all important, “I am not from here, I don’t have a clue what you are saying to me”. I spent most of my time in the city saying obrigada (thank you) because it was the only word I could remember, this might have had me look like I was a crazy person, but at least I was polite crazy person. Bom dia (good morning) Boa tarde (good afternoon) and Boa noite (Good night) also came in handy, when I could remember which one was which, but I mostly got around with a smile and a translator app. 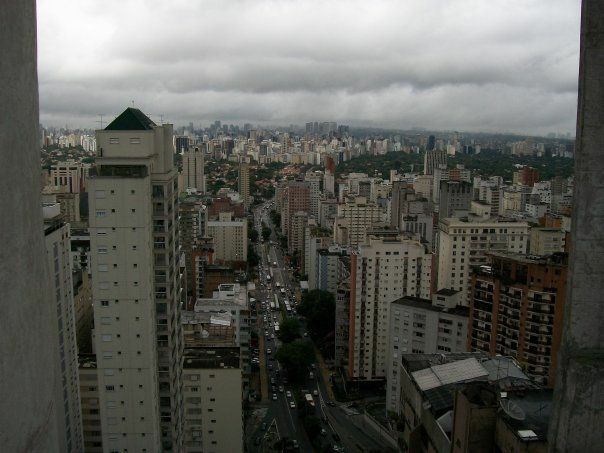 I had heard about São Paulo’s humid subtropical climate and that the country itself has no dry season (year-round rainfall). But experiencing it is a whole different thing. I went in summer which takes place between January and March when temperatures range between 17 °C and 28 °C and was amazed at how quickly the weather would change. One moment you are strolling down the street on a lovely summers day and the next you are completely drenched. I was amused and impressed to see that locals are completely ready for this, as concealed umbrellas are produced out of just about everywhere allowing them on with their daily lives, while tourists huddle into shops to stay dry. A local told me that São Paulo is known for its rapidly changing weather, all four seasons can be experienced in one day, and she was not wrong (I’m told, it is worse in the winter). The city is pretty crowded so traffic can be crazy. I found the cheapest and easiest way for tourists to get around is to use the subway/metro, trains and trolleybuses as much as possible, and then take a taxi for shorter distances. I opted for the metro as my main form of transport in the city as it can get you anywhere for a minimal fee. These subways even have shops at the stops so you could do some underground shopping. Brazil’s currency is the real (plural reais) which works out to roughly 100ZAR to 21BRL, things are fairly affordable and you can pick up souvenirs at a steal thanks to all the shopping districts such as the Centro Commercial Aricanduva which is the largest shopping mall in Latin America, the Fair of the Republic Square which houses more than 600 craft stalls and markets and the São Paulo Municipal Market, an amazing building with exquisite stained glass windows which is pretty much a mall meets a market where you can find everything from food to clothes. My personal favourite was the Sunday market in Liberdade (the Japanese district of Sao Paulo) which is said to have the largest amount of Japanese people outside of Japan (who knew). Visiting there is like leaving Brazil for a few hours, as you enter the district you are bombarded with the sights and sounds of Japan and you automatically notice the change in décor as lanterns line the streets, and shops and restaurant welcome you with Japanese signage. The market itself is pretty interesting and you can even have an authentic Japanese massage on the side of the road right next to a stall offering a variety of eats. I’m not big on street food but thanks to the multitude of restaurants, many of which are affordable family style/ buffet style eateries, I was still spoiled for choice. Brazilian favourites seem to be meat, beans, rice, and some more meat. Be careful when ordering as most menu’s do not have an English option and you might end up ordering something that is not quite your style, like my pasta with litchi and cheese which did not go down well, neither did the countries national cocktail, the Caipirinha, made with cachaça (sugar cane hard liquor), sugar and lime, which although delicious nearly knocked me on my head. On the plus side it did put me in the mood to discover the city’s nightlife. In Sao Paulo’s entertainment districts of Rua 13 de Maio and Jardins, you can find nightclubs offering everything from salsa, to jazz and disco. Port and Airport Police Division. Special services for tourists and protection for dignitaries. Rua São Bento, 380, 5th floor, Centro. Tel. (11) 3107-5642 and 3107-8332. Headquarters of the Specialized Tourist Police – DEATUR. Av. São Luiz, 91, Centro. Tel. (11) 3214-0209 and 3120-3984. São Paulo Police Station at Congonhas Airport. Avenida Washington Luis, Moema. Tel. (11) 5090-9032, 5090-9043 and 5090 9041. São Paulo Police Station at Cumbica/Guarulhos International Airport. Rua Dr. João Jamil Zarif, Guarulhos. Tel. (11) 6445 3064, 6445-2686, 6445-2162, 6445-3464, 6445-2221.